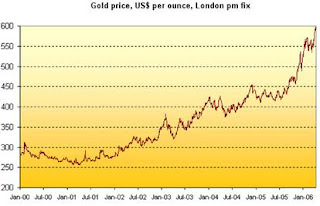 Haq's Musings: Is Demand in South Asia Driving Up Gold Prices? India is boosting its gold reserves as percentage of is total reserves held by its central bank. Gold prices hit an all-time high of $1097 a troy ounce after India's decision to buy 200 tons of gold from IMF announced Monday. Prior to this decision, India's gold reserves stood at 557 tons, 11th largest in the world. By comparison, Pakistan's state bank gold reserves stand at 65 tons, or 41st in the world. LAHORE: Pakistan is the eighth biggest consumer of gold in the world and annually imports 127 tonnes gold but unfortunately there is no consumer satisfaction and Pakistani jewellery industry suffers from unfair competition by those who under-carat gold and therefore sell at a lower price. Non-existence of hallmarking results in Pakistan’s increasing loss of exports, self-dependence and less acceptability of Pakistani jewellery products in local and global markets. These views were expressed by the speakers at a seminar titled “Latest Trends in Jewellery Hallmarking”, organised by Pakistan Gems and Jewellery Development Company (PGJDC). Speaking on the occasion Project Director (PITMAEM), PCSIR Dr Shahzad Alam said that in order to improve the quality of jewellery products, complete quality assessment and hallmarking of gold is imperative. He informed that hallmarking refers to physically marking a piece of jewellery according to specific laws to certify the purity of metal. Hallmarks are small markings stamped on gold, silver and platinum articles. A hallmark means that the article has been independently tested and guarantees that it confirms to all legal standards of purity (Fineness). These tests are carried out only by an assay office. A number of successful jewellery industry in the world use hallmarking both as a marketing tool and to ensure consumer confidence, he added. PGJDC CEO Fawad H Khan informed that the decision to develop hallmarking in Pakistan is part of national strategy submitted by SWOG and ministry of industry’s support. It was aimed at helping Pakistan’s small and medium sized enterprises to reposition themselves on a more competitive footing in the domestic and global markets. Fawad said that apart from other countries of the world implementation hallmarking law in Pakistan would help country increase its export to approximately 18 signatories’ countries of Vienna convention. He said that the main objective is to create awareness among common people and to improve the image of our local jewellery industry at international levels. He informed that PGJDC is working on setting up an assaying and hallmarking system with the help of government organisations like (PITMAEM, PCSIR Labs complex) and to develop a strong cooperation between local and international manufacturers of gold jewellery.